There are 6 posts filed in videogames (this is page 1 of 1). Just days ago, Nintendo surprise-announced Tetris 99 for the Nintendo Switch, which brings the Battle Royale concept to the Tetris universe. Tetris 99 is developed by Arika and published by Nintendo. The game pits you against 98 other Tetris players in a real-time fight to the death. If you’re a Tetris nut like me, that sounds like a recipe for an amazing game. Best of all, the game is free, although it does require a Nintendo Switch online subscription to play. A subscription costs $20 per year, which is significantly less than pretty much any other competing gaming service. A few notes on the overall experience outside of the gameplay: As of this writing, the game itself is pretty bare bones. You can view some stats but as far as I can see there are no real leaderboards. You can choose between two pre-programmed control schemes. But there’s no private games for you to set up between you and a limited number of players, nor can you party up and enter a Battle Royale game together with friends. You also can’t play against bots. Early reports have suggested that there will be updates to the game, so hopefully at least some of these options will be added in a future update, but we’ll see. When you get into the game, it’s basically the Tetris we all know and love. The Tetriminos move the way you’d expect. You have the option to hold a piece to deploy later, plus to see a listing of six future pieces you have coming up. KO which distributes your garbage to those that are closest to being knocked out. You can also target users by using the left stick and moving your reticle over an individual player on the screen, or if you’re using the Switch as a touchscreen, you can just tap on the player you want to target. I found targeting players individually to be a bit too much to manage, so I just generally went with one of the main four options. When you KO a player, you get badges for doing so and you also collect any badges that that player had. Each KO gives you a certain percentage of a badge – two KOs gives you one badge, four KOs gives you a second badge, and so on all the way to 16 KOs for the fourth badge. The more badges you have, the more damage you inflict on your opponents. Speaking of inflicting damage, the bar on the left side of the screen shows you what garbage is being sent your way. The garbage doesn’t appear on your board instantaneously – that’d be pretty overwhelming. Instead, it appears after a certain amount of time. It starts at gray and eventually turns yellow, red, and when it’s on fire, that’s when it’s about to deploy. Any lines you get during this process will go towards clearing the garbage that’s targeted at you. As the game progresses, you may want to try keeping track of want to switch your targeting to KO the most amount of people, or the people with the most badges, or ideally both. A well placed KO late in the game can give you the badges you need to win the game. Certain line clears will get you more garbage lines sent. For instance, a tetris will send four lines, but T-spins in particular sends out a bunch of garbage. A T-spin that results in three lines cleared can send six lines, plus any multiplier badges you may have. If you do an all-clear, which means clearing all lines off the board, you send out four garbage lines, plus any multipliers. If you are being attacked by many players at once, you get garbage line bonuses for each clear. For two opponents you get one line, and for three or more opponents, you basically get an extra garbage line sent out per player. I found Tetris 99 to be incredibly addictive and polished. I don’t remember ever experiencing any lag, despite playing with 98 other players on a wireless connection. The classic Tetris gameplay is immensely enjoyable and satisfying. It’s an amazing feeling to KO a bunch of players in a row, or to find yourself in a challenging situation and need to build yourself out of it. Plus, I love the remix of the classic soundtrack, which manages to sound new while still obviously paying homage to its predecessors. Overall, and I’ve already gotten $20 of value out of it, which is the amount I paid for Nintendo Switch Online for a year. I hope they continue to add to it as time goes on. If you like the inventiveness of Tetris and you like the Battle Royale, you’re going to love Tetris 99. It’ll remind you why Tetris is so ridiculously addictive in the first place, and why this game is one that continues to stand the test of time. A few times each year, a videogame comes out that’s so fun and engrossing that it takes over my life for a couple of weeks. Beating the game becomes my obsession — I find it difficult to re-join a story-driven game after I’ve taken a week or two away from it. Recently it’s happened with Horizon: Zero Dawn. Then a few months back with God of War. And now it’s happened with Marvel’s Spider-Man for PS4 (hereafter simply abbreviated Spider-Man), whose 20-hour campaign I just completed after about a week of play time. Spider-Man is a revelation. Where previous Spider-Man games have been uneven at best, Spider-Man probably does the best job of capturing what it feels like to be Spider-Man: The constant pressure to do good in a city where crime is thriving, the challenge of balancing the mundane life of Peter Parker with the outlandish adventures of his alter-ego, the freedom of having Manhattan as your playground as you whiz through the air at terminal velocity. The game does this all while telling an engaging story that arguably does a better job of capturing the spirit of Spider-Man than even Spider-Man: Homecoming. One of the reasons I think this game is so appealing is because it’s a throwback to a simpler time of storytelling. Spider-Man has a moral clarity to him that is absent in modern day stories (even those in the Marvel universe). He fights crimes. He tackles supervillains that are literally cartoonishly evil. In side quests, Spider-Man finds missing persons. He recovers lost pets. The guy even tries to solve global warming. There’s something refreshing and pure about a character that just wants to make the world a better place. I wouldn’t describe it as naive; I’d describe it as emerging from a different time. There are the good guys (Spider-Man himself, the police, journalists), there are bad guys (privatized paramilitary organizations, Electro, etc. ), and there are those that can be redeemed (no spoilers for the game here). There’s no such thing as collateral damage in this world — a phenomenon even Homecoming and the Avengers films have tried to reckon with. You see Spider-Man obliterate a city block to stop a villain but you never need to worry about the consequences of those actions. We don’t really see stories like this anymore, and for good reason: the world is more complicated and endlessly politicized now. Our storytelling has gotten more complex and nuanced to keep up with it. The media’s position as a force for good in the world is complicated at best, as is the role of police. These days, the idea of a vigilante with superpowers who feels that he alone can solve everyone’s problems is more likely to raise alarm than put people at ease. Maybe that’s why Spider-Man is so appealing: it gives us a glimpse into a world where simply having the best intentions and the willingness to sacrifice was enough to make a difference. I think we’d all like to see that world return. But I don’t think it will. On the topic of Spider-Man, GameSpot did a neat video essay explaining why this game is a big deal for Insomniac. Leonard Pitts Jr. has written a piece for the Miami Herald wondering what social media is doing to our morality and empathy. Lenika Cruz has written my favorite piece about Bojack Horseman: Season 5 and what the show is trying to say about how Hollywood deals with bad men. If you have any interest in the show, I’d strongly recommend you check it out. Comedian Rob Delaney has written a devastating piece on the passing of his son, Henry. Most experiences I’ve had at GameStops have been positive. The staff has been knowledgeable, enthusiastic, and helpful. But between the piles of used games, the warranties, and the endless tchotchkes everywhere, I’ve always felt like employees are tasked to upsell like their lives depended on it. The more new games an employee sells, the more used games they’ll have to sell to make up for it. In other words, according to salespeople speaking to Kotaku and elsewhere on the internet, GameStop is incentivizing employees to stop people from buying new games and hardware. GameStop staff say the company has threatened to fire people who don’t hit these quotas, which is leading to all sorts of scuzzy tactics. I have a few friends at GameStop who confirm that these details are largely accurate. It’s a sad state of affairs and I hope the company puts a stop to this. If a company structures its incentives incorrectly, sub-optimal behavior will always follow. For another example of this, see: that infamous Comcast phone call. Also, Wells Fargo. I was absolutely stunned to hear today that Ryan Davis has passed away at the age of 34. The cause of death was not released. I followed Davis’ work — in writing, audio, and video — since his time at Gamespot, through the departure of Greg Kasavin, Rich Gallup, and ultimately Jeff Gerstmann and Davis himself, as the latter two went to set up shop at Giant Bomb. It is not an exaggeration to say that the /Filmcast and any of the shows that have come afterwards would likely not exist without the inspiration of people like Davis and all the fine folks over at Giant Bomb (as well as the now-defunct 1up network). Their shows didn’t just serve as templates for the work that I would end up doing; they also provided endless hours of free entertainment and detailed analysis that have enthralled me for years. Davis and crew blazed a trail for a style of podcasting that was loaded with hilarious tangents, entertaining riffs, and non-stop pop culture references. His demeanor was utterly relatable, yet harsh when a game/film called for it. Through it all, you could always sense his desire to entertain and deliver high quality content at the same time. The online world has lost a great this week. 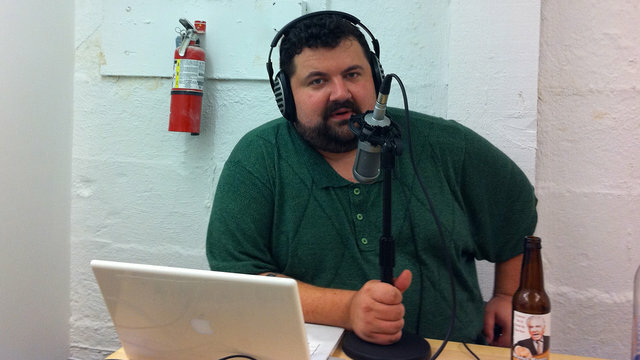 R.I.P., Ryan Davis. I grew up on movies and on video games, and love and respect what they bring to the table. Though I enjoy them on different levels, they both have given me moments of wonder and serious reflection. As an avid gamer and film lover, I find it a shame to see how one medium has gained artistic acceptance while the other continues to be derided by the mainstream. There are many reasons why they are looked down upon, but if you give them a shot, you just might conclude that video games should be considered art. I recently purchased my own Kinect and I’ve been having lots of fun with it, although I’ll be curious to see if more games come out that take full advantage of it. One thing’s for sure, though: whenever I’m using my Kinect, I feel like I’m living in the future.